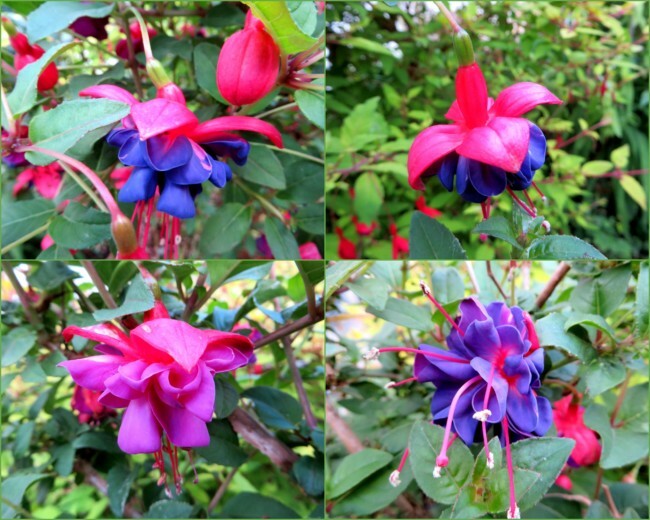 Gertie’s Garden Diary in June … First Part. 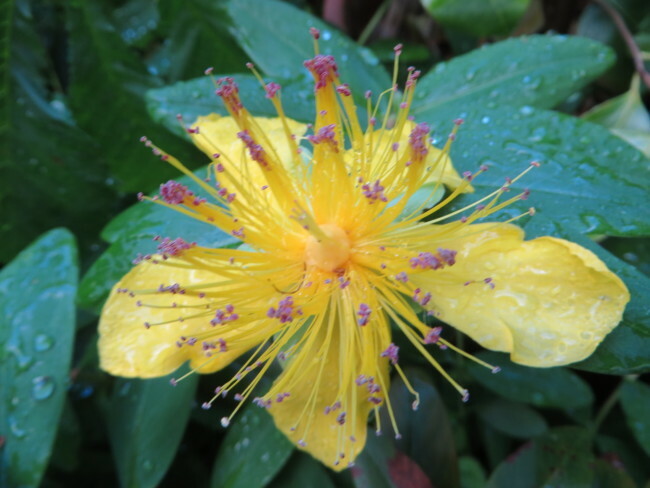 Peace bloomed fully on June 1st. 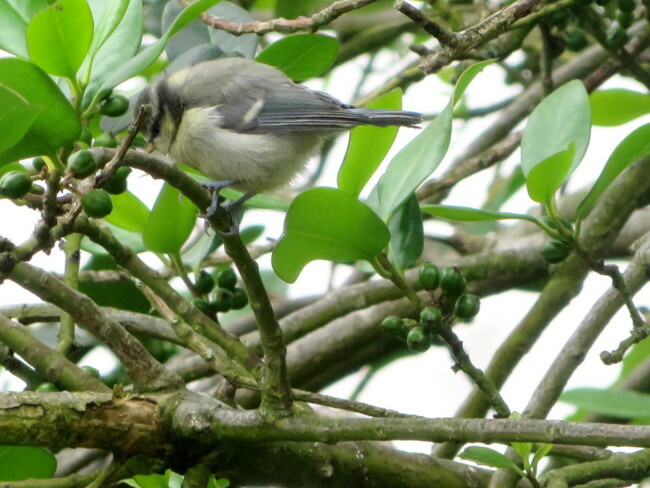 And a pair of Stoggie s bounced about in the Holly tree, looking for a way to get into the bird feeders …..
Black Elder blossoms [Sanbucus niger ], deliciously frothy pink, are taking over from Clematis Montana, and a black cat revisited and sat in the place where Monty last sat. 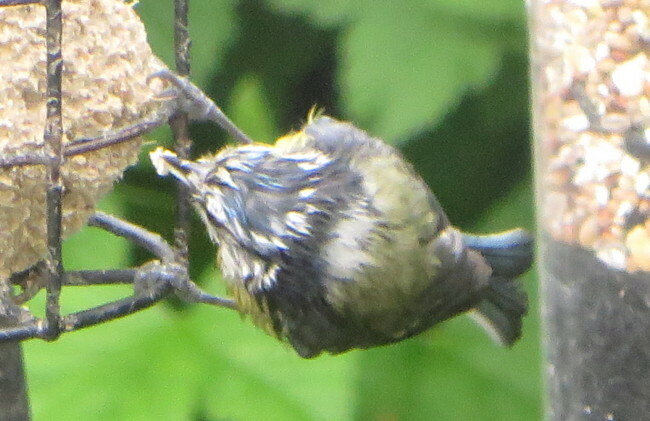 This bedraggled little critter has been working hard for its offspring that sits and watches from the Holly tree! 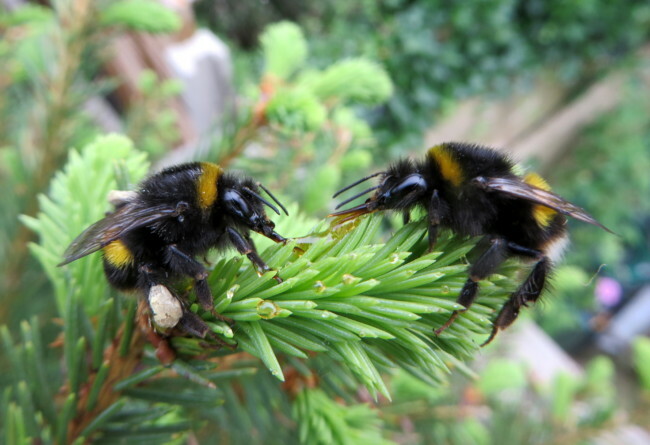 A few days later, I rescued two more with reviving honey. 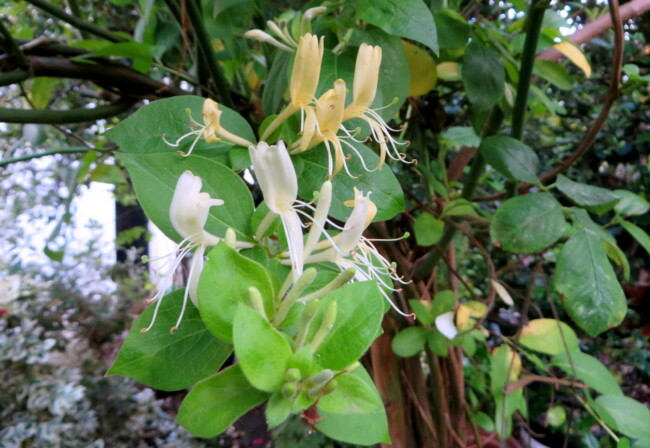 Have cut down most of the Honeysuckle … extraordinary stuff, so strong and tenacious. 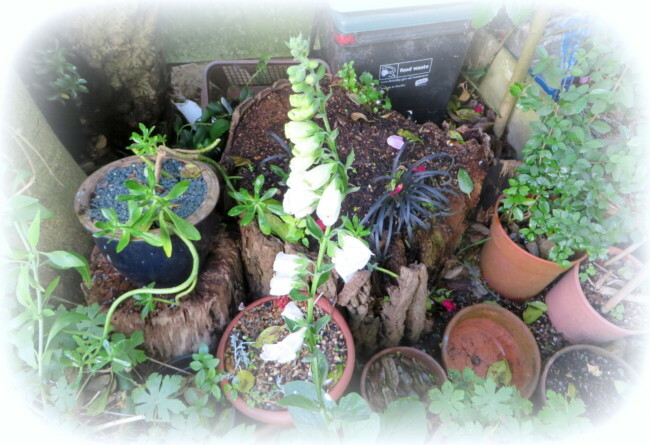 I will definitely re-plant some bits I have save when I am ready as I think it will be strong enough to grow again. 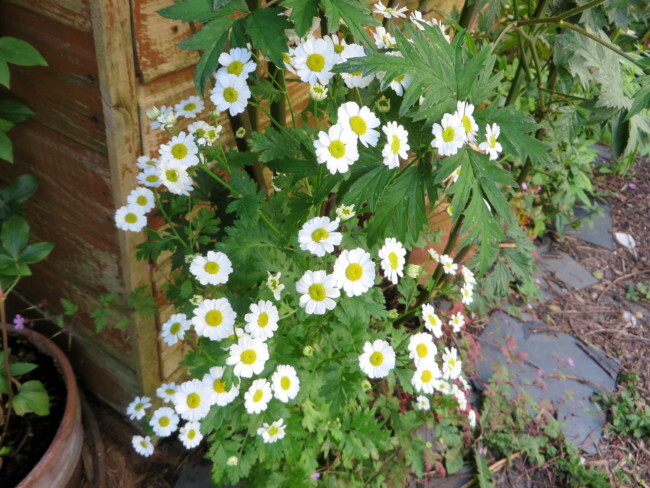 It has grown entwined and blossomed in other areas of the garden … I won’t lose it! 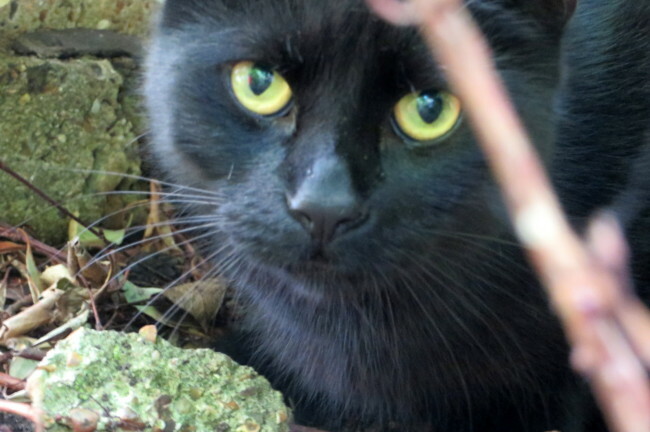 Meanwhile, next week, when the jollifications over the weekend are finished, I will dig out the roots [I hope!! ]and prepare the proposed new bed in the sunshine. For now it’s a messy work in progress … but oh, such light ! 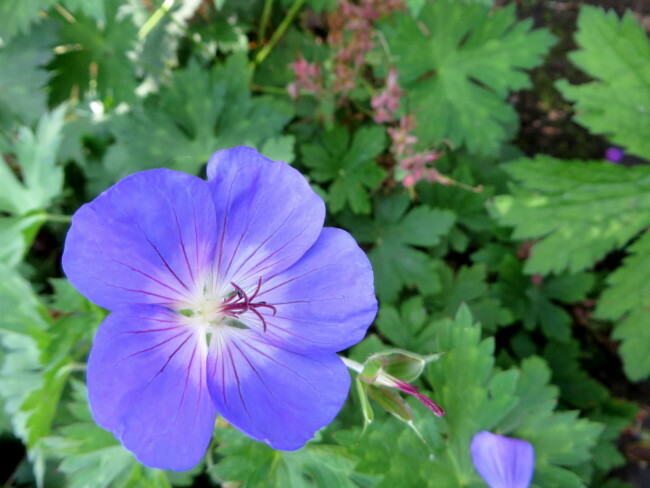 The blue Geranium is back … yes! 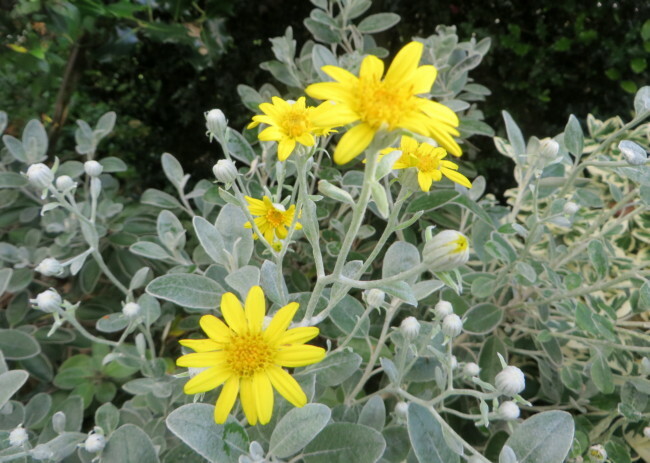 … and Fuchsias are beginning to bloom …..
….. also the daisy-like flowers of Senecio shrub, Daisy Bush ? 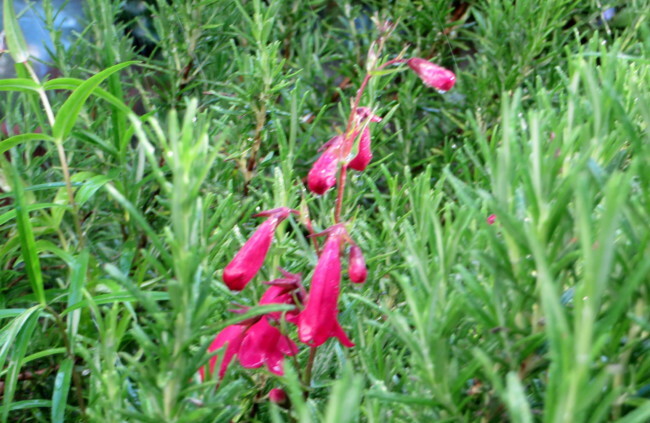 …..
….. and Penstemon as I sprayed a shower over it from the hose! 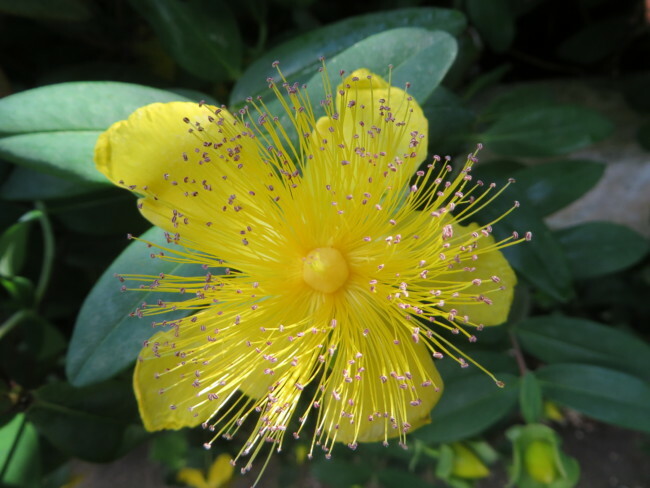 The yellow Hypericum has two forms in GG. 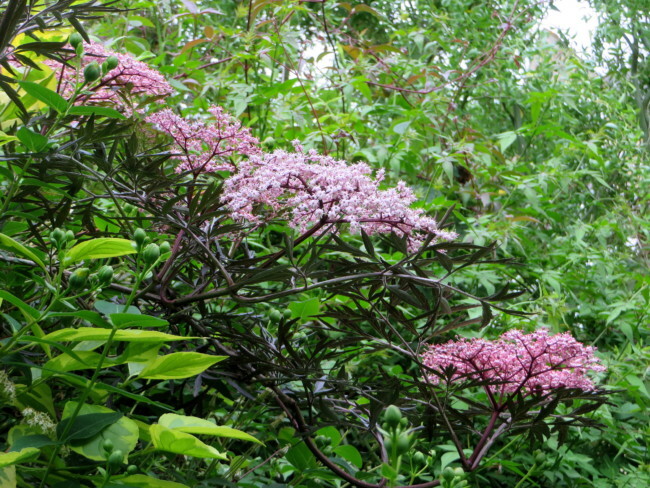 This is a bush , where it perfectly contrasts with the Black Elder, and its pink sprays of flowers ….. 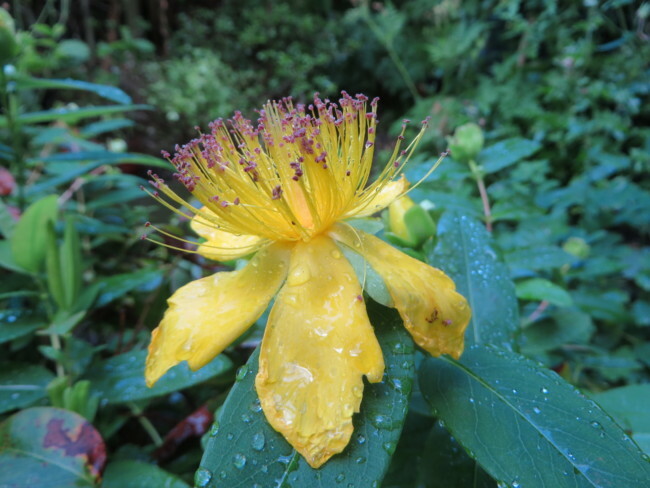 This one, St John’s Wort, with its fluffy pink whiskers, grows low and prolific! 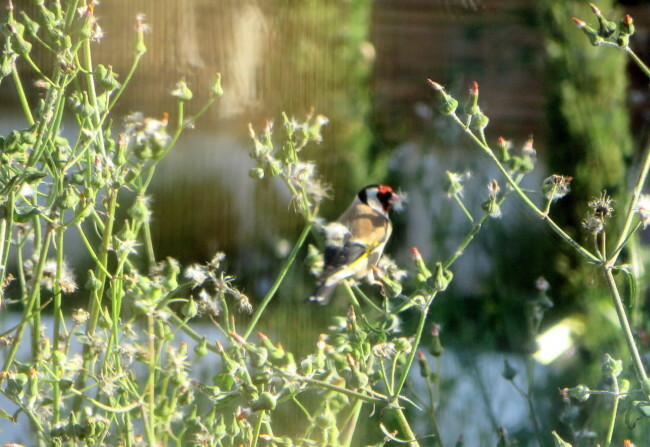 In the mass of weeds growing in a corner of the posh, new gardens over the back, a Goldfinch was having a feast, as it perched on the gently swaying stems in the evening light. 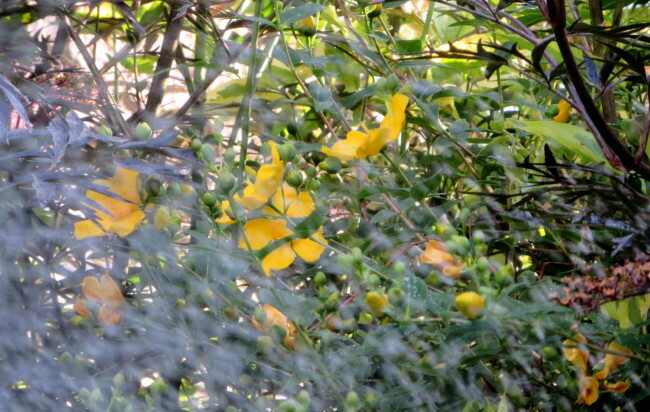 This afternoon , after a cool start, the sun is shining and I am sweeping the paths: it needs doing every day what with leaves moulting from the Holly, petals from a fast turn-around of roses and other leaves ripening and being shed … never stops! 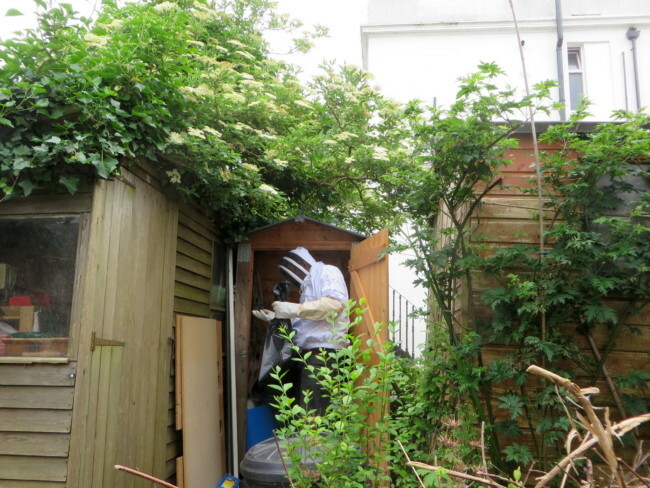 I was sad that there was no one wandering through GG on the weekend, but realise that, apart from lack of time, it has become too closed in and crowded, so am vigorously cutting back certain unwelcome ‘pushy’ vegetation, before I get on with digging out the Honeysuckle roots … a step too far in energy-use at the mo! I was looking back at photos from around six years ago and felt that there was something to be said for clean, navigable paths! 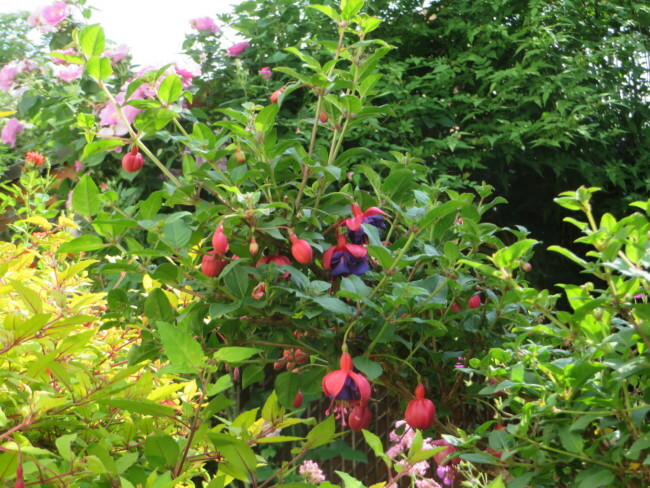 He little Scarlet Roses are lovely at the moment , despite the ‘Black Spot’ … great brown splodges, on most of the leaves. 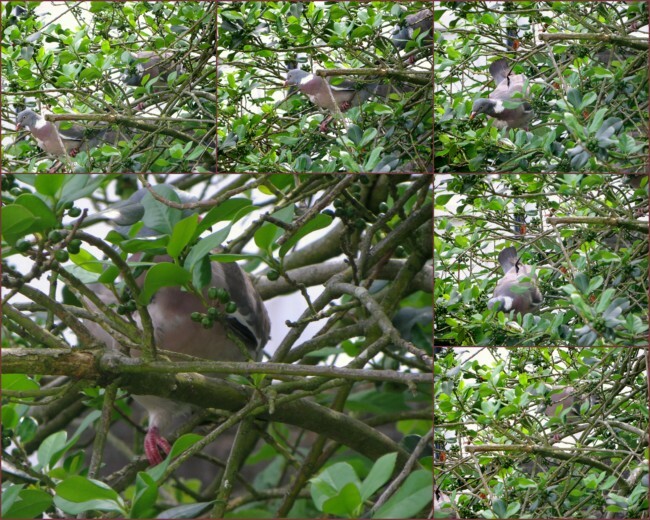 I have cut out lots of it, but frankly know not what to do next as I can’t seem to eradicate it. 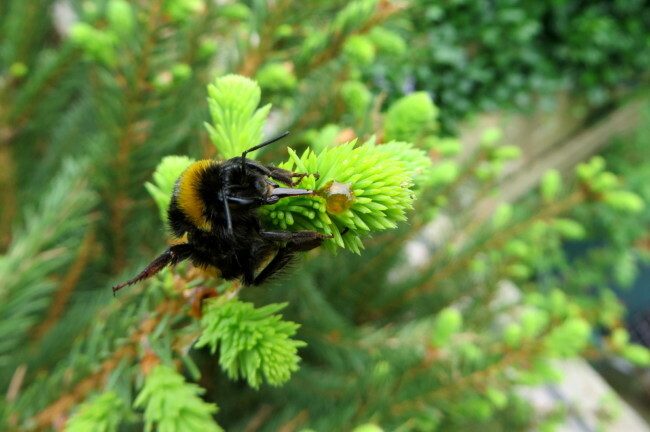 I hate spraying with fungicide but may take to doing so when it’s nearly dark: I worry for the bees. 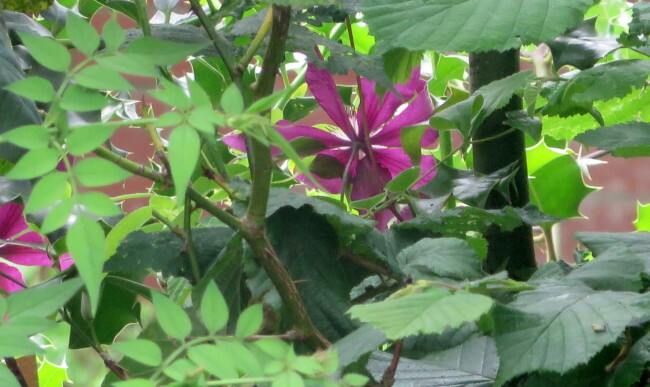 ….. and this year, this one [maroon Clematis] got away to the other side! 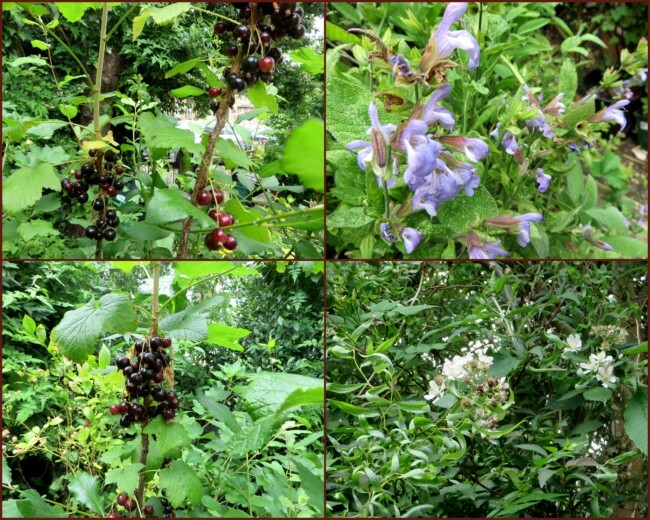 … but these came back … along with some edibles, tho’ strawbs are naff! So far so good …… a remarkable recovery after a cold and crazy start to the growing year. 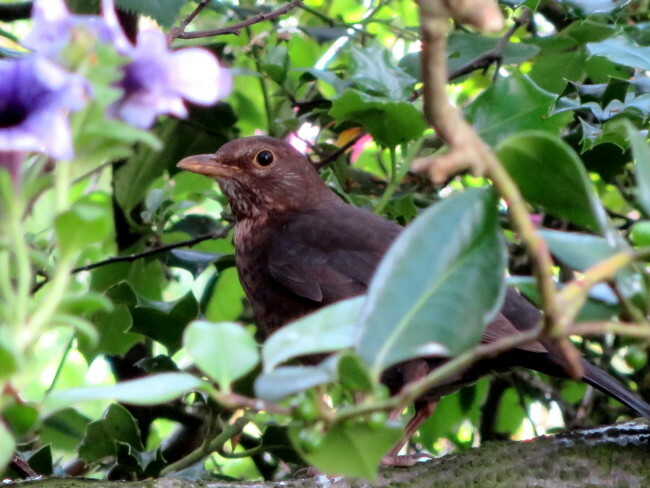 Am now in the process of continuing cutting back, pruning, making a new bed [better late than never] and enjoying it….. and did I mention that Dom is pretty sure that the Blackbirds didn’t desert their nest, the young one fledged! 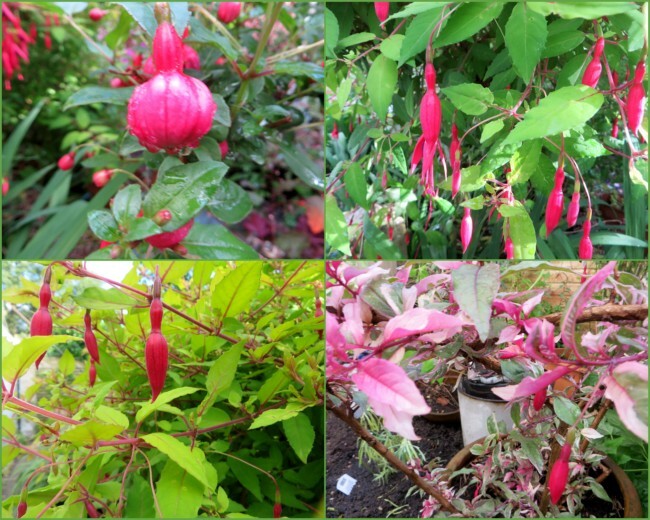 It all looks very colourful Anne, some beautiful bloomers there. 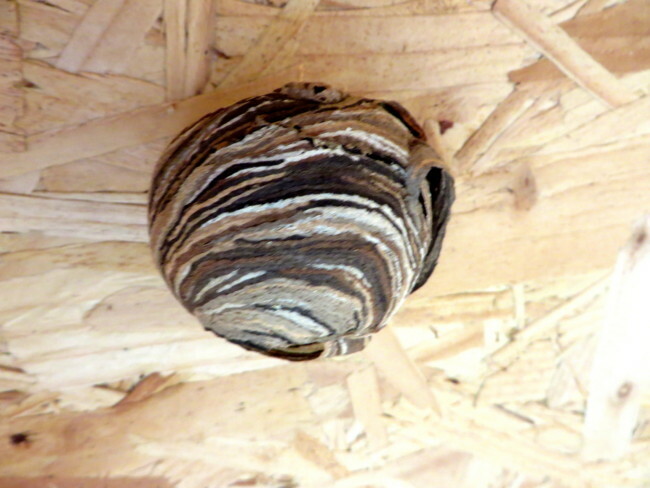 Incredible structures these wasp’s nests but not what you want in the shed I wouldn’t personally spray roses for black spot, too dodgy for the wildlife. 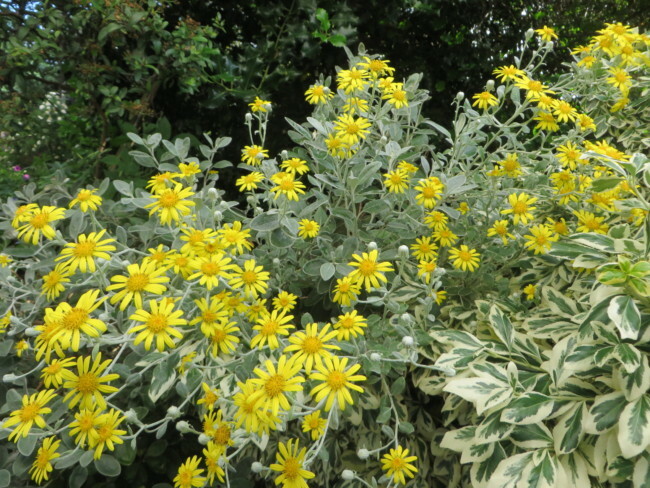 My Zephrine Drouin rose has it every year but it doesn’t affect the blooms so I can ignore the leaves. Do be careful digging up your roots, isn’t there a strong man would do it for you? It is exciting to have a new project though. I look forward to watching the progress. 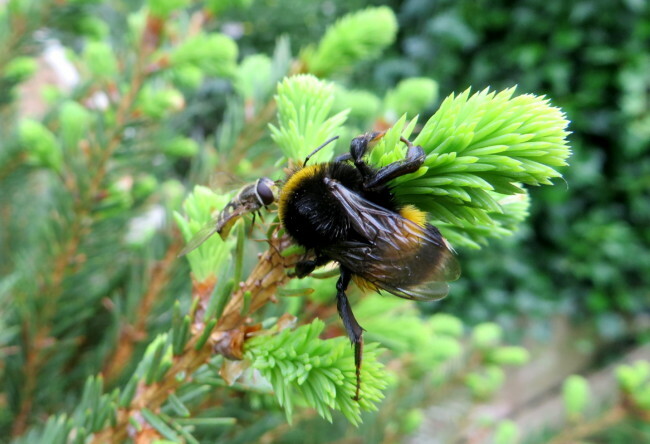 Your garden looks glorious, Anne and brilliant that you helped to save some bees! Why is it that younger people often suffer from a lack of tact and imagination simultaneously? I refer to your daughter’s use of the word “cluttered” – which could equally have been used by my own daughter. Have either of them ever looked closely at how Nature grows? It’s pretty cluttered too. Lovely photographs as always, Anne – and the picture of rubbish bagged for the dump struck a chord here too. Wish I had more bags. 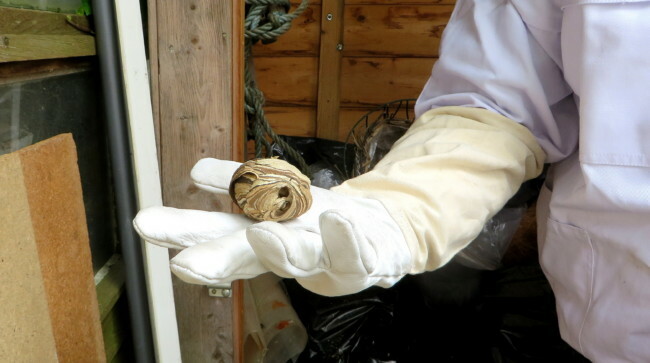 I re-use the sacks too, which are mostly old compost bags – just need more of them, as I can still see behind me in the overhead mirror while driving. Car is in an awful mess. 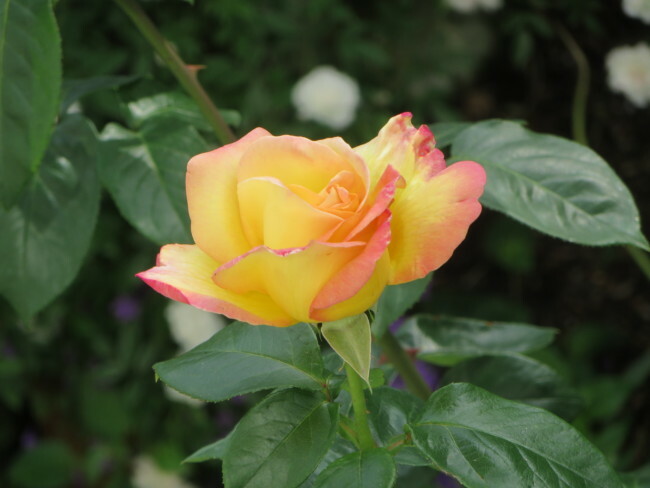 Lovely wild garden gertie, my roses are just starting to bloom. Must take some keeping up with but well worth it. 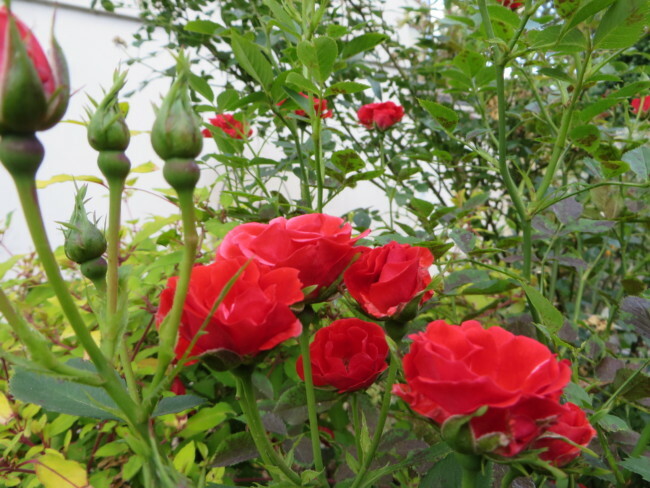 Interesting how your roses are only just beginning to bloom. 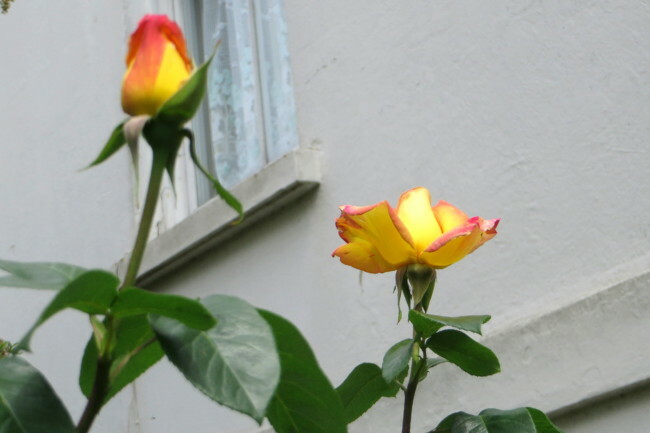 I notice, when we are driving around, how in different areas, roses in particular , have varying timetables for blossoming! 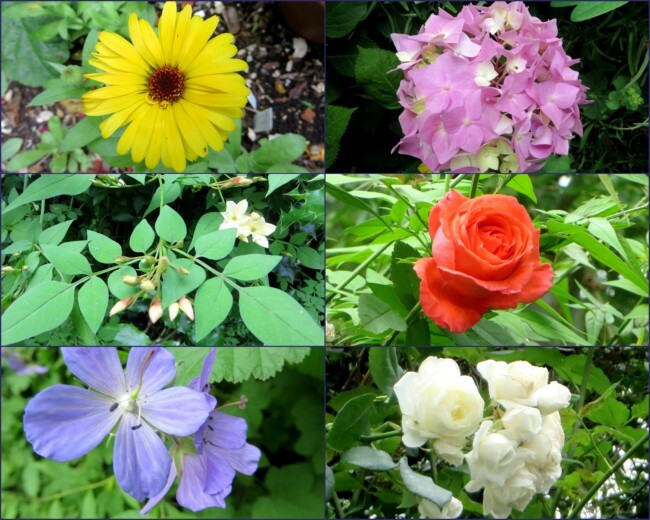 Beautiful garden and super photos. 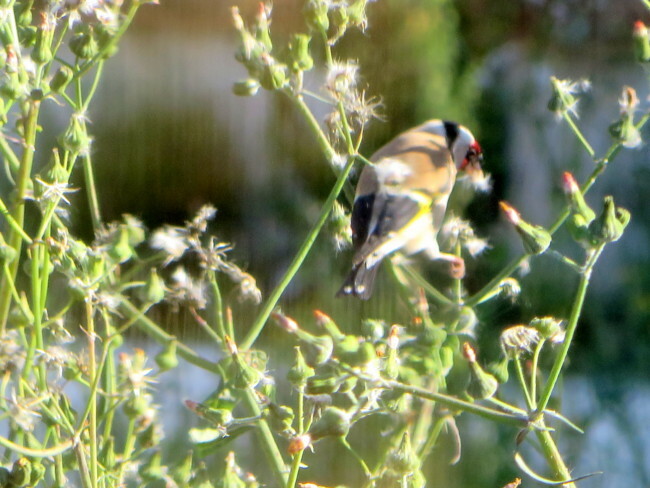 I cannot seem to get close enough to get my birds. 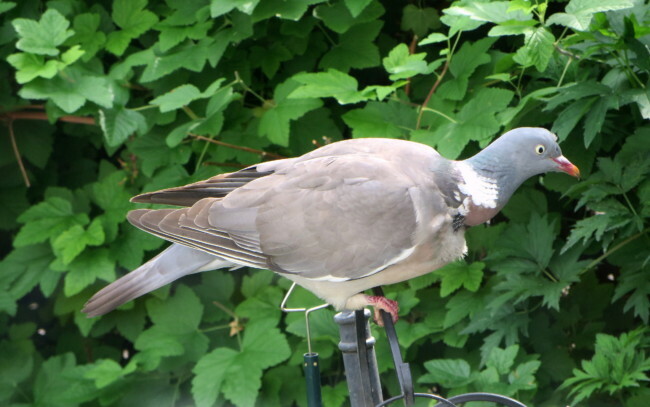 A lovey look at your garden Anne, it has a glorious amount of colour and varation in it. Our gardens never stop needing to be rearranged or reinvented, but are so forgiving, it can be hard to be a bit ruthless with some of our well established plants that have perhaps out grown there welcome, but the new possibilities are endless, with extra space,light etc, can’t waits to seemthe end result, but don’t over do it. 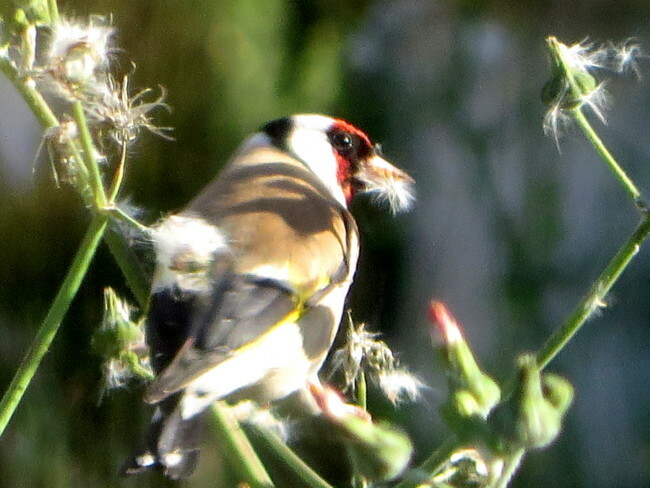 Oh bless you Susie …. 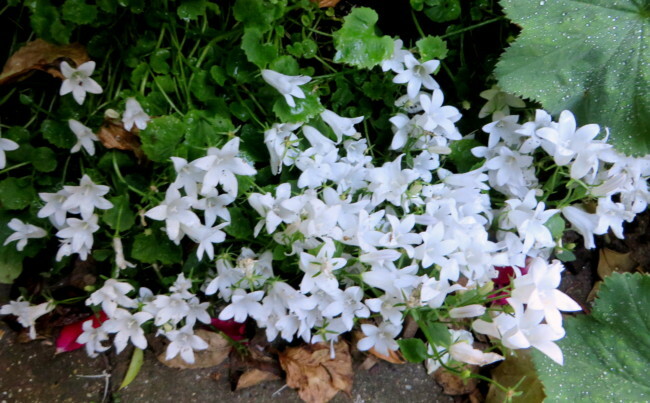 I would love to have a space like yours where you have gravelled and potted on raised beds [that’s how I remember it so I hope I have it correct ] it’s so very clear and pretty, but we must work with what we have.